Seismic activity in Spain has an ambiguous nature: normally considered to be of moderate risk, reality tells us that the Iberian Peninsula has suffered devastating earthquakes with recurrence intervals of more than 100 years. This makes it more realistic to consider it as ''high, but unlikely''. This perception involves that critical systems such as railways, and more specifically High Speed Rail, do not apply risk analysis techniques against earthquake occurrence nor do they have warning, alarm or control systems. 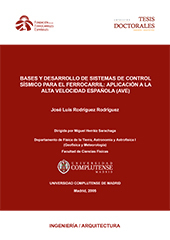 This thesis analyses the causes and effects that the occurrence of an earthquake would have on High Speed services in Spain, suggesting a system that, integrated into railway signalling equipment, would allow early detection of an earthquake as well as appropriate decision-making regarding such event.